Ohm Boy OC and GrimmGreen have revised the beloved Recoil RDA with an even bigger, more versatile build deck and a new AFC top cap. 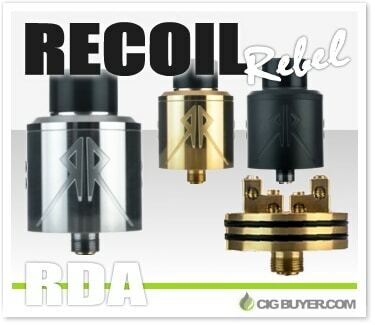 Designed to provide a no frills coil building experience, the Recoil Rebel RDA implements a two-post design in staggered orientation, presenting four 2.5mm terminal openings for a wide range of large and complex coil configurations. The build deck also features a new ULTEM insert, preventing leakage while providing additional cooling. Like the original it includes two top caps; the Cloud Cap (“snake bite”) returns with two angled airholes on both sides, along with a new AFC adjustable top cap that provides more control.